I can’t help myself: I am kind of excited that fall is on the horizon — especially after Sarah’s centerpiece DIY yesterday. Here in Seattle, we’re still in the early fall stages where the leaves are sloooowly changing and the light is shifting. Everything feels a little bit moodier, which I absolutely love. There’s something about darker light that makes colors pop more and creates even more of a dramatic feel. 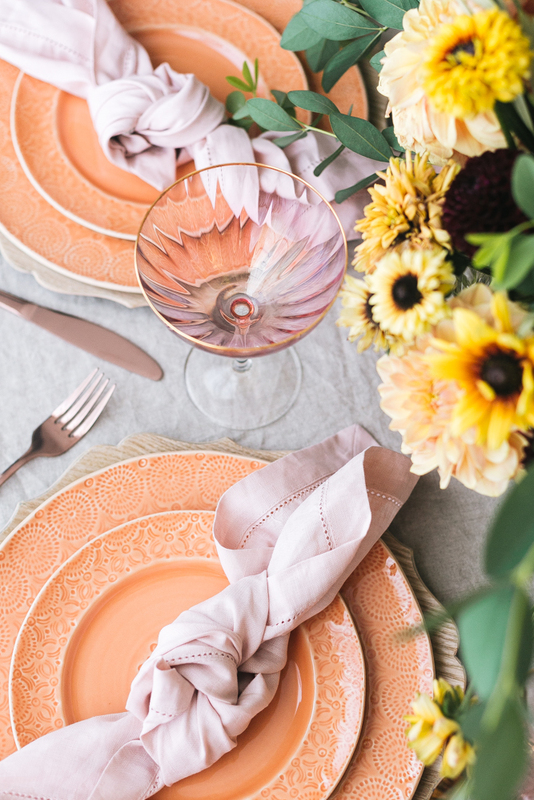 For this fall themed tablescape, I embraced the sunset tones that make me think of this time of year: dusty pale pink and coral orange, especially. Then I used natural tones of woodgrain and linen to make them pop just a little bit more. I’m really happy with how unexpected this tablescape feels for me, too… like a departure from some of the past tables I set. 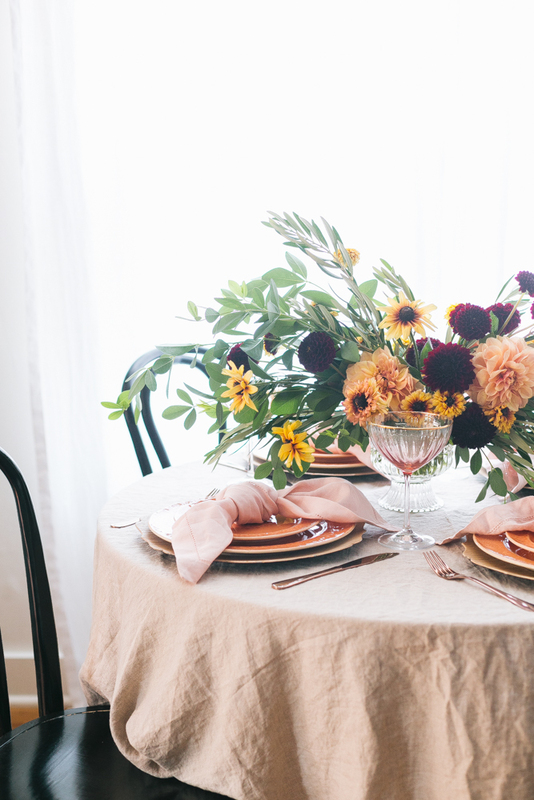 Is there anything better than a lightly rumpled linen tablecloth? 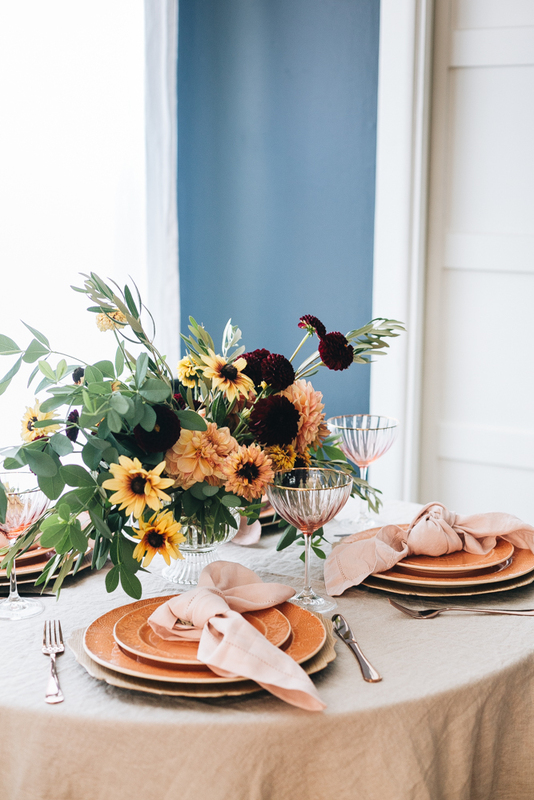 For me, it’s always the simple touches that help to elevate a tablescape and make it feel special. I am also a huge fan of linen napkins for the same reason. For this tablescape, in place of traditional napkin rings or even a folded napkin, I thought it would be a fun, casual touch to knot the napkins instead. I really love how it makes the table feel modern, but also casual. What do you think? 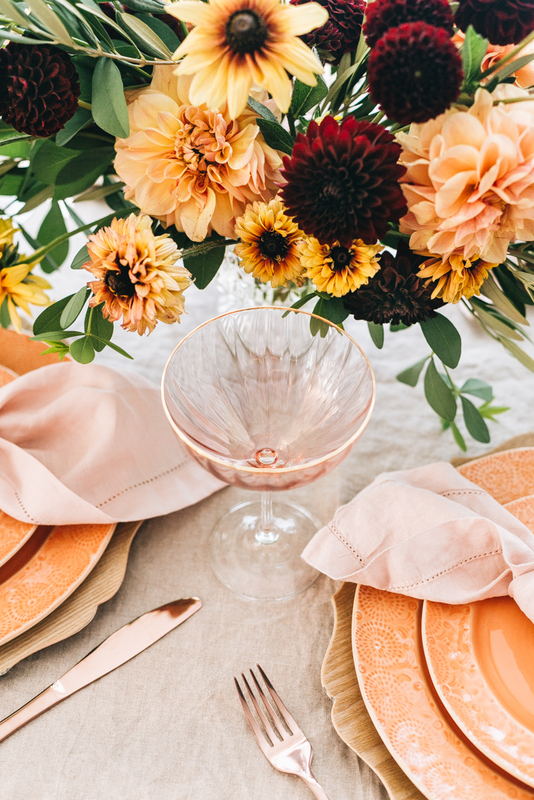 Also, I chose pink for the napkins to pull out more of the peachy, coral tones in the dahlias in the centerpiece. At first, I placed napkins that were almost the same hue as the dinner plates, but I felt like a little more contrast and interest was needed. As for the plates, my obsession with these wooden chargers continues! They serve as the perfect natural, organic element for this tablescape. As we get closer and closer to fall and holiday entertaining, I’m sure these chargers will make a few more appearances. On top of each charger, I layered the textural Old Havana dinner plate and salad plate in an orangey- coral hue. 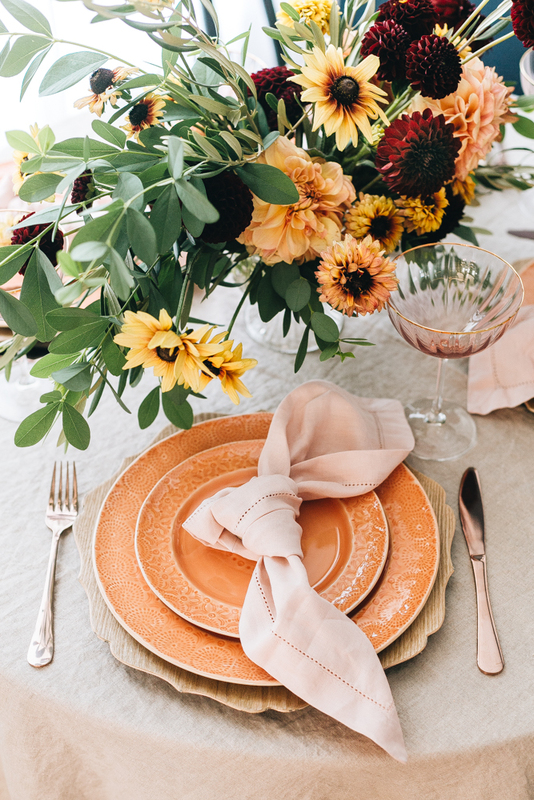 I absolutely adore how these plates mimic the rich, warm tones of the centerpiece… which was my goal! I wanted to convey a feeling of a warm sunset and I think using these embossed, patterned plates really helped. I chose a rose gold set of flatware in a modern, clean shape to further build the autumnal aesthetic. Also, everyone needs a touch of rose gold in their life! And, lastly, these pink and gold rimmed coupe glasses are the loveliest finishing touch. I love everything about them: the height and scale, the sophisticated ripples in the glass, and the pale pink color of the glass. They are the perfect vessel for serving champagne to guests! 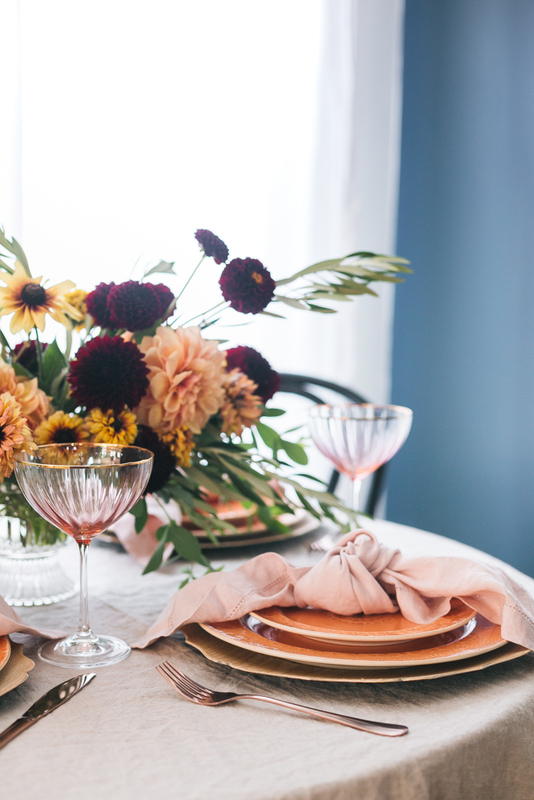 Get more entertaining posts here + learn how to make this peach and burgundy centerpiece of dahlias!